I love eggplant but I hate frying them but I love their buttery texture when they’re fried. First world problems, amirite? I’ve tried grilling, I’ve tried baking, I’ve tried broiling eggplant to recreate that fried buttery texture, but to no avail. Until I tried steaming them. Whatever magical alchemy is happening under the steamer results in a smooth, creamy texture reminiscent of fried eggplant but without, you know, gobs of oil. This simple dish is enlivened with a fiery chili sauce and pairs perfectly with some jasmine rice. 1. Trim the eggplants, cut them in half lengthwise, and sprinkle lightly with salt. Leave for at least half an hour to draw out the bitter juices. 2. Steam the eggplants over medium-high heat for about 10 minutes or until tender, preferably in a bamboo steamer fitted over a wok. Leave to cool and then cut into 3-inch pieces. 3. Combine the soy sauce, vinegar and sugar, stirring to dissolve the sugar. 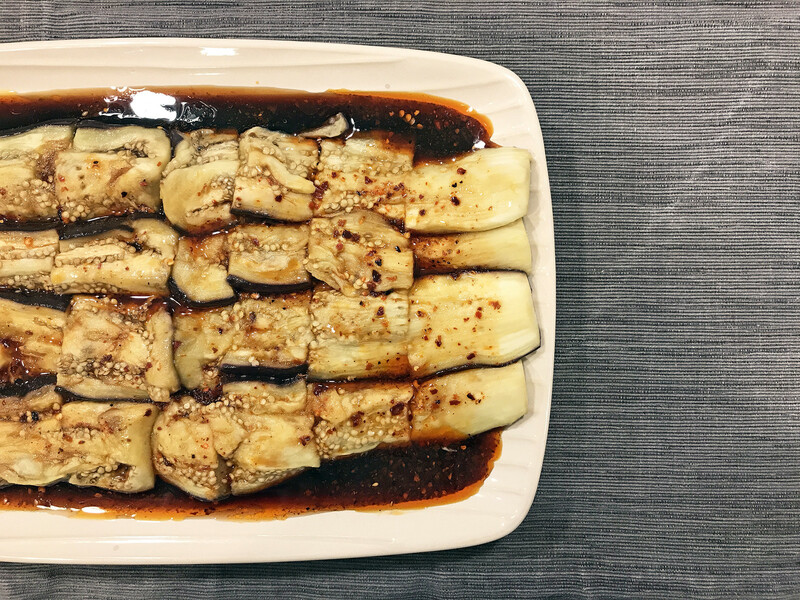 Mix in the oils and pour the sauce over the eggplant on a serving platter.